Named in honor of its legendary creator and Fuente family patriarch, Don Carlos Fuente, Sr., Arturo Fuente Don Carlos cigars are one of the world's finest smokes. These cigars are rich and flavorful, with flawless African Cameroon wrappers, making them as appealing to the eye as they are to the palate. Ranked #4 Cigar of the Year by Cigar Aficionado in 2015. Fabulous! Arturo Fuente's Don Carlos is a special blend created by Carlos Fuente Jr. to honor his father, Don Carlos Fuente, Sr. the patriarch of the Arturo Fuente empire. The vintage hand selected rare filler are encased in rich, toothy West African Cameroon wrappers and aged for approximately 10 years. This craftsmanship produces the ultimate, creamy leathery finish. The result is a work of pure genius. No wonder Don Carlos is known as the “Pride of the Fuente Family”. I know Don Carlos would be proud. The medium to full bodied Don Carlos Belicoso Natural resonates with complimentary superior flavors of nuts and dark chocolate with notes of cedar and toast. The finish is enriched with sweet and sour flavor. Immaculately flawless, the Don Carlos Belicoso was named #4 Cigar of the Year in 2015 with a 94 rating by Cigar Aficionado magazine. 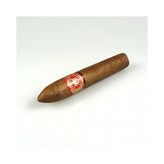 One of the world’s most elite cigars, the Belicoso is a powerhouse and should not be saved for special occasions only. To savor the first-class experience of Arturo Fuente Don Carlos Belicoso Natural pair with the finest brandy. The best known brandies in the world are Cognac and the rarer Armagnac from their respective regions in France. Keep in mind a brandy with flavors of dried fruit and oak will complement the Don Carlos woodsy sweetness. If your bank account allows, the Castarède 1969 from Bas Armagnac has flavors of honey and caramel and would be my personal preference.